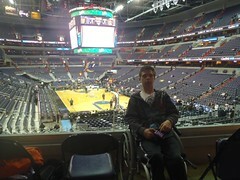 The Wizards game at the Verizon Center was my first NBA game. I still do not much care for NBA, as it college basketball is way better with actual defense and offense. Mik liked the game, but it was not that great with the teams being pretty sloppy. Mik did not mind the handicap seats, but they were not as amazing as the ones he had sat in just a week before at the Suns game. They definitely are not bad, but they fail the cup holder requirement that Mik has held as a number one priority for handicap sections since we were doing All the Ballparks in 2009. 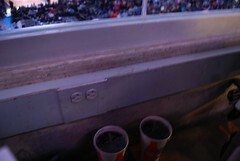 I cannot remember if the regular seats in section in front of or behind us had cup holders, though.